Atopic dermatitis (AD) is a chronic skin disorder associated with biochemical abnormalities in the patient's body tissues and immune system. It is characterized by inflammation, itching , weepy skin lesions, and an individual or family history of asthma , hay fever, food allergies , or similar allergic disorders. Atopic dermatitis is also known as infantile eczema or atopic eczema. The word atopic comes from atopy , which is derived from a Greek word that means "out of place." Atopy is a genetic predisposition to type I (immediate) hypersensitivity reactions to various environmental triggers. It includes bronchial asthma and food allergies as well as atopic dermatitis. Secondary skin infections: Children and adolescents with AD frequently develop infections from bacteria that live on the skin and multiply when the child's scratching causes breaks or open sores in the skin. Most of these secondary infections are caused by Staphylococcus aureus and Streptococcus pyogenes . HOMEOPATHY Homeopathy is the single most common CAM approach to atopic dermatitis in Europe, although it is frequently used in the United States as well. One German study followed a group of 2800 adults and 1130 children diagnosed with AD who were treated by homeopathic practitioners. The researchers found that over 600 different homeopathic remedies were recommended for the patients, although Sepia , Lycopodium, Sulphur , and Natrum muriaticum were the remedies most frequently prescribed. Most homeopathic practitioners in the United States as well as Europe consider AD a chronic condition that should be treated by constitutional homeopathic prescribing rather than by what is known as acute prescribing. In constitutional prescribing, the remedy is selected for long-term treatment of the patient's underlying susceptibility or constitutional weakness rather than short-term relief of present symptoms. Close-up view of atopic dermatitis in the crook of the elbow of a 12-year-old patient. See also Allergic rhinitis ; Allergies ; Asthma . "Atopic Dermatitis." Section 10, Chapter 111 in The Merck Manual of Diagnosis and Therapy , edited by Mark H. Beers and Robert Berkow. Whitehouse Station, NJ: Merck Research Laboratories, 2002. "Hypersensitivity Disorders." Section 12, Chapter 148 in The Merck Manual of Diagnosis and Therapy , edited by Mark H. Beers and Robert Berkow. Whitehouse Station, NJ: Merck Research Laboratories, 2002. Pelletier, Kenneth R. "CAM Therapies for Specific Conditions: Eczema." In The Best Alternative Medicine , Part II. New York: Simon & Schuster, 2002. American Academy of Allergy, Asthma, and Immunology (AAAAI). 611 East Wells Street, Milwaukee, WI 53202. Web site: http://www.aaaai.org. National Institute of Arthritis and Musculoskeletal and Skin Diseases (NIAMS). 1 AMS Circle, Bethesda, MD 20892–3675. Web site: http://www.niams.nih.gov. 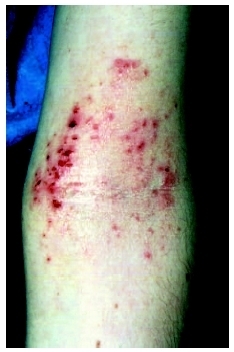 Krafchik, Bernice R. "Atopic Dermatitis." eMedicine , January 23, 2002. Available online at http://www.emedicine.com/derm/topic38.htm (accessed November 22, 2004).